Home agricultural conservation stewardship maryland association of soil conservation districts natural resource protection Sustainability sustainable agriculture Sustainable Ag: We're Certified Stewards! Sustainable Ag: We're Certified Stewards! Sustainability isn't a hot topic on our family farm, it is a way of life. Recently, our way of life was certified by Maryland inspectors as being a "Certified Agricultural Conservation Steward" under the Farm Stewardship Certification and Assessment Program. (FSCAP). 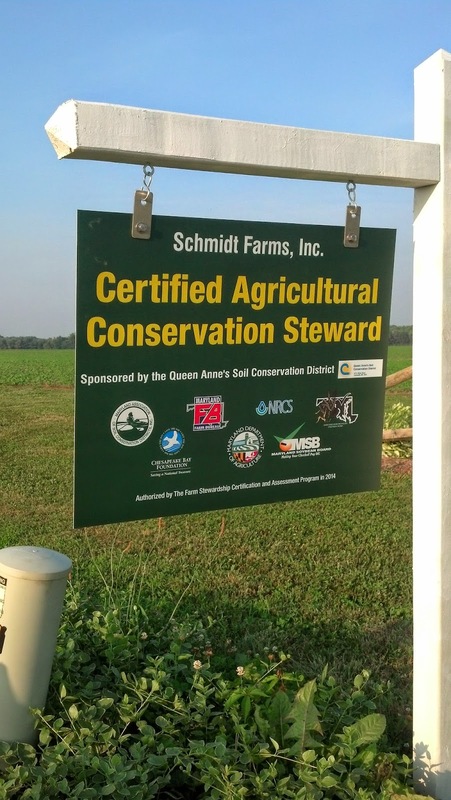 The program is sponsored by the Maryland Association of Soil Conservation Districts, and farmers must meet the ACSCS standards in order to gain the status of "Certified Steward". Under the FSCAP program, we voluntarily submit to inspections of both recordkeeping and have all our fields inspected to ensure that not only have we documented the conservation we have put on the ground, but that we maintain and preserve those practices to ensure that excess nutrients and sediment do not leave our farm. Going through our mandatory nutrient management plan, the inspectors look for soil, manure, and plant tissue analysis and that what we apply to our plants and soils is what is required by the crop. They look at our approved soil conservation and water quality plan to make sure that all the conservation recommendations were implemented as directed. They make sure our fertilizer receipts match our application records. They make sure we correctly complete and submit to the Maryland Dept of Agriculture the mandatory Annual Implementation Report (AIR) for all fertilizer use. Once the records pass inspection, they walk the fields, inspecting the conservation on the ground. These are practices that provide natural resource protection such as buffers around bodies of water seen below. We're required to have a 30 foot buffer but ours is more like 1000 feet from this stream. On the right, you see trees that were planted as part of the Conservation Reserve Enhancement Program (CREP). This program is a voluntary land retirement program that removes production agriculture from sensitive land such as this one adjacent to the stream. 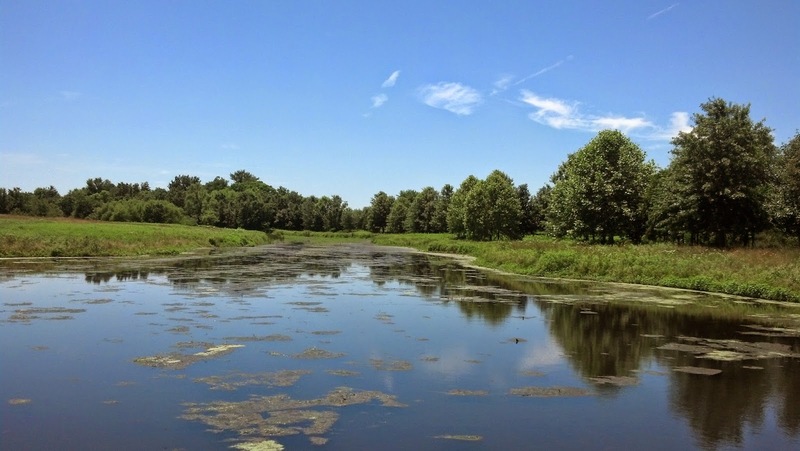 The practice of setting aside land that is sensitive is a very sustainable approach that actually benefits the larger downstream community more directly than it benefits us. In total, we have taken 120 acres of land out of agricultural production over the last 15 years, in addition to the implementation of many other active conservation practices. Cover crops is also another conservation practice we put into place on as many acres as we can every fall. These crops take up any remaining nutrients in the soil left over from the crop we just harvested, and then slowly release those nutrients in the spring as the crop decomposes in the field acting as a sort of green manure. This practice adds to the sustainability of our soils by enhancing the qualities, improving the nutrients and organic matter and overall soil health which is critical to the sustainability of the farm for future generations. Precision ag is another sustainable practice that we have employed on our family farm. 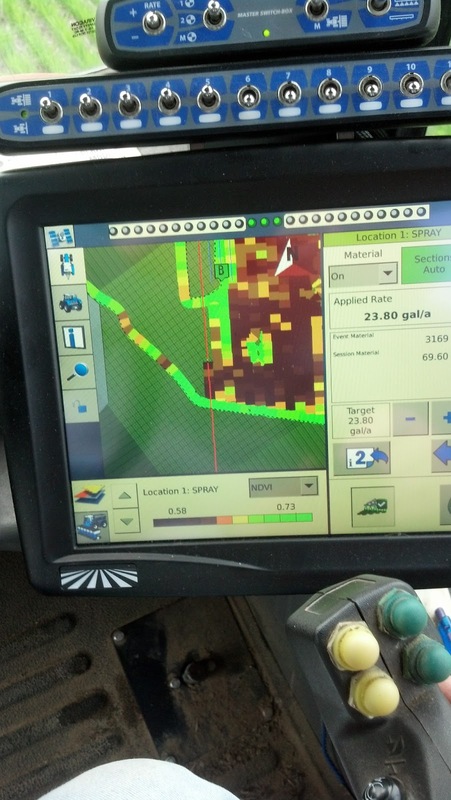 Using the newest technology allows us to use less fertilizer by reading the chlorophyll content of the plant and the computerized technology in the tractor adjusting the rate of the fertilizer based on the specific crop. This saves us both economic resources and provides an environmental benefit to the larger watershed community around us. Conservation tillage is a big part of our sustainable agricultural practices. We use both no-till and conservation tillage. Above you see Hans getting ready to no-till which means he is seeding a new crop directly into the residue of the previous crop (note the brown corn stalks on top of the soil). No till means we do not plow and therefore do not turn over the soil, exposing it to erosion, sediment and phosphorus loss. Our top soil and its health is our livelihood. We do all that we can to preserve and protect it. All human activity has an impact on the environment, agriculture included. Sustainable agriculture is about being responsible to preserve and protect the resources that we have that provide food and fiber for our neighbors, while protecting the soil, water and environment for the now and the future. There is nothing at greater stake than the future sustainability of family farms like mine. Certification in agricultural conservation is striving for the best for our land, the best for our surrounding and downstream communities, and most importantly, the best stewardship for the next generation to operate this family farm. Visit our conservation stewardship page at: FSCAP Schmidt Farms Inc.